This article is a brief introduction about building a simple call distribution system in relation with Ozeki VoIP SIP SDK. After reading through this page you will be fully familiar with all the essential terms concerning call distribution technology and what you will need for creating your own solution using Ozeki VoIP SIP SDK. 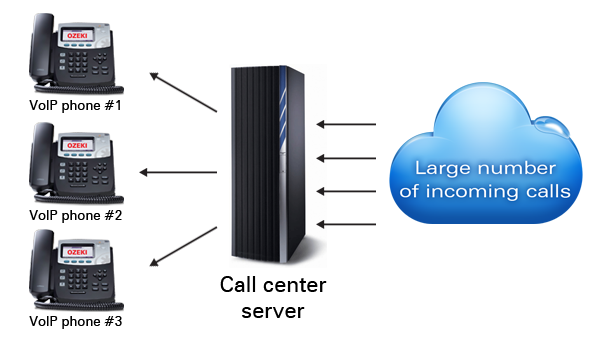 Call distribution is a process made by the call center server application that transfers the incoming customer calls according to some preset rules. The call routing rules can vary from the very simple to a really difficult and adaptive one. The simplest call distribution can be made by choosing the first available call center client and transfer the incoming call to it. In this case the first available client means the first one in the client queue, like having the smallest client ID. This simple call routing technology can be implemented by only using a client queue and the server gets the first element of the queue and transfers the call to it. The actual transfer method mainly depends on the process how the call center clients are put back to the queue. If the client queue is sorted by client ID it means that the first element in the queue will always be the client with the smallest ID. In this case some of the clients will get more calls than others. For example, the client with the largest ID will only get a call transferred to them if every other client is engaged. If the clients are always put back at the end of the queue the distribution will be more balanced and as for the implementation, this method is even simpler than the previous one. All the call routing methods can be implemented when using Ozeki VoIP SDK. You define the routing type and classify the end-points. When implementing automatic call distribution, the call is transferred via blind transfer. If you want to see actual implementation solutions for call routing, you can check Introduction to automatic call distribution page. You can, of course, define your own call routing methods too. This article introduced you the basic knowledge about simple call distribution technology and showed how Ozeki VoIP SIP SDK can help you to fulfill your wishes about this topic. If you have read through this page carefully, you already have all the knowledge you need to start on your own solution. If you are looking for a detailed guide, you can find it in the IVR Training section. Here are several example codes with which you can get to know and try these functionalities.